This incandescent novel chronicles both an internal journey and a physical trek into the heart of Africa, a place caught between the dangerously alluring modern world and its own tenacious past and traditions. 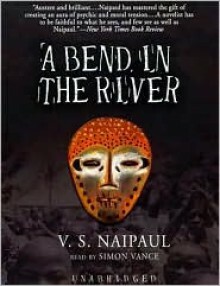 Exploring political and individual corruption, it expresses skepticism about the ability of newly decolonized nations to forge independent identities.Salim, a Muslim Indian merchant, opens a store in a sleepy small town at a bend in the river, whose inhabitants include a Belgian priest, a witch, and a white intellectual named Raymond. The president of the new country is a demagogue called the Big Man who hires Raymond as his speechwriter. Salim loses control of his store to the commercially inexperienced Citizen Theotime, who hires Salim to manage it. Gradually, the town's veneer of civilization begins to crumble.